It has been almost a month since the New York Times published a series of shocking allegations against Hollywood producer Harvey Weinstein (known for Gangs of New York, Pulp Fiction and Shakespeare in Love), sparking almost every big name in the industry condemning his actions and leading to his Academy membership being stripped – only the second time in history that this has happened. Weinstein has been accused to have harrassed female employees across three decades, with recognisable names such as Gwyneth Paltrow and Angelina Jolie speaking out about their experiences of this inexcusable sexual abuse. This is probably the most high-profile scandal of this kind to ever happen in the film industry but it certainly isn’t the first (Woody Allen, for example, has had many controversial allegations made against him in recent years), and probably won’t be the last if history is anything to go by. We must question how this scandal has managed to go unnoticed for 30+ years given the amount of women that have now come forward and spoken out against Weinstein’s inexcusable behaviour. There have been reports of Weinstein paying off those who have threatened to come forward in the past, but this explanation as to why this scandal has been allowed to happen is far too basic in my eyes and, fundamentally, we can link Weinstein’s actions to the patriarchal foundations on which the film industry in Hollywood has stood since its very first days. Attempts to theorise the role of women in Hollywood, particularly in its Classical period, have drawn similar conclusions – that women are portrayed as submissive, insignificant objects of a spectacle. Central to these ideas is Laura Mulvey’s highly influential essay, ‘Visual Pleasure and Narrative Cinema’ from 1973, in which she theorises the male spectator of Classical Hollywood cinema and argues that films made during this period were constructed in a way that makes the male (both the protagonist within the film, and the spectator of the film) the active participant, whilst the female is passive – her only purpose is ‘to-be-looked-at’. These ideas are significant even now, 40+ years later, as they illustrate that Hollywood has always been a ‘world’ in which (rightfully or wrongly) men hold the power over women. In a culture that has always placed men in control as both spectators, protagonists and viewers, it’s hardly surprising that men with the power in industry terms like Harvey Weinstein have continually abused this power for many years – throughout their working lives they have constantly been delivered reinforcing messages that solidify the notion that men are above women and suggest that this kind of behaviour is just something that happens in the filmic world. The divide between men and women in Hollywood is slowly improving – in 2010 Kathryn Bigelow was the first woman to win the Academy Award for Best Director in Oscars history. Yet in 88 years of these prestigious and industry-defining awards she is still the only woman to have won this award and still, to this day, the number of popular films that fail to pass the Bechdel Test (to pass, a film must have at least two women in it whom talk to each other at some point during the narrative about something other than men) is highly surprising; in 2016, blockbusters such as Batman vs Superman: Dawn of Justice, Deadpool and Passengers all failed to pass what should be such a simple test. The culture in Hollywood therefore still appears to reinforce what should be archaic ideas that men deserve to have the power both behind and in-front of the camera and that women should be passive in all aspects of the filmmaking process. If the films being produced don’t spread the message that women are more than a spectacle to-be-looked-at, what’s stopping men like Harvey Weinstein exploiting them for years to come? I’ve decided to try and do something a bit new on my blog – on the first of every month I am going to publish something I’ve named ‘The Monthly Review’, a feature where I’ll be listing and discussing all the films that I’ve been watching. Hopefully this will not only provide some insightful comments and recommendations but also encourage me to watch more films than I already do as well as watch a more diverse range of films, something I am wanting to do after beginning to study modules with narrower, more specific focuses on my degree. Please let me know in the comments or via social media if you have any ideas on changes/developments I could make to this series! LOGAN – This was a pretty easy choice for me, I absolutely loved Logan. A fantastic film that refuses to be restricted by the ‘superhero’ genre. It is unique, uses its 15/R rating to great effect, showcases extrodinary acting talent and is probably the first ‘superhero’ film to have such a profound emotional effect on me. Couldn’t recommend it more highly. Honourable mentions to – Moana, Beauty and the Beast, Jaws. This one goes to two, very different films for very different reasons. It was impossible to decide because they are worlds apart in every way. SUSPIRIA – Dario Argento’s 1977 horror is a notorious classic, known as one of the most graphically violent and terrifying films of all time, it’s not one I jumped at the chance of watching. Unfortunately, a week on Postwar European film in my European Cinema module meant I had to watch Suspiria against my will and it was actually the total opposite of what I expected. Of course, its timelessly scary in places and not for the faint-hearted, but it was a film I took so much out of stylistically; the gorgeous use of colour is not something I will forget in a long time. Classifying it as ‘surprise of the month’ not just because its jumpy, its a refreshing watch in comparison to the stylistically absent horror films made in recent years. LIKE CRAZY – This Sundance winner from 2011 is a film that’s been on my radar for a number of years after having heard it compared to Blue Valentine, one of my all time favourite films. I finally got round to watching it this month and was utterly blown away, had I not created this category it would’ve hands down been my favourite film of the month. So much surprised me about this film, the way it totally absorbed me for 90 minutes and made me feel emotions that only a few films can do. Worth watching for the brilliant performances of the two leads alone, this is an indie film that beautifully encapsulates everything that independent cinema is about. Some of the films I saw this month weren’t instant favourites, but there was only one film I watched this month that I absolutely hated and that was CINDERELLA. I am a big Disney fan, and although I don’t love every single Disney film, I’m usually very good at finding something likeable in each. Unfortunately this was not the case with Kenneth Brannagh’s live-action remake of the animated classic, I found it a tiresome, predictable and very lightweight watch. Very few of the characters were likeable let alone convincing and to me it genuinely felt like the kind of thing you’d see on TV at a weird hour. 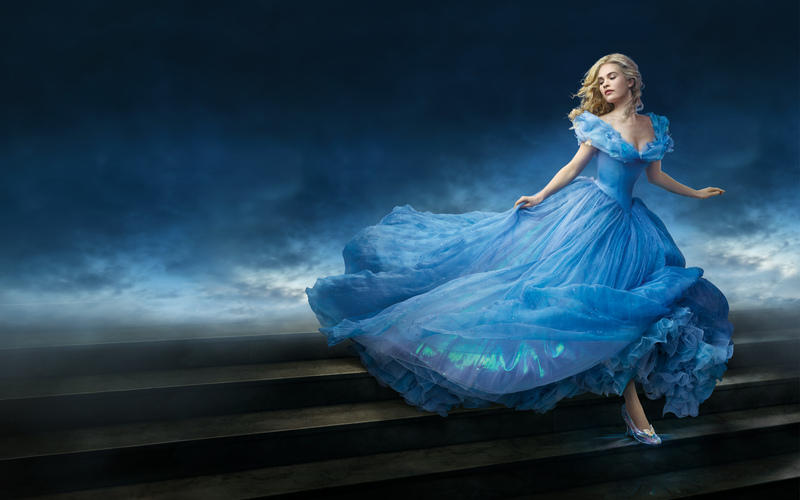 It’s film that’s flaws are brought even further to light by the new reboot of Beauty and the Beast – if you want a good live-action Disney film, avoid Cinderella at all costs and watch that instead. I just got back from seeing La La Land in the cinema for the third time. If I’m perfectly honest, I could go and see it again right now and love it just as much. The last time a film had an effect this profound on me was, ironically, another film by director Damien Chazelle, Whiplash. The first time I saw La La Land I sat in the cinema in utter awe for the entirety of the credits and spent the whole of the following day trying to somehow pin down its brilliance. Quite often, the films I champion don’t do as well as I think they should but this looks to be quite different; with a record breaking number of Golden Globes and a whopping 14 Oscar nominations, La La Land is doing better than I could’ve ever dreamed. Success appears to come at a cost, with some (okay, still a minority, but the fact these comments exist astounds me) critics arguing that ‘Chazelle refuses to write strong female characters’, ‘the musical performances are mediocre’ and ‘the ending is a great disappointment’. None of these issues or criticisms existed when La La Land was first released, they didn’t even exist when La La Land broke the Golden Globe record. Yet as the film has been more and more successful people have started to pick it apart to such extremes that they’re starting to find really ridiculous deep rooted issues with the film. It quite fundamentally comes down to the fact that people don’t like success, they don’t want to accept the fact that this is a near perfect film and they can’t bring themselves to watch this piece of art and really lose themselves in its technical brilliance. One of the things I truly loved about La La Land is the way it so beautifully tributes the Classical Hollywood period, yet simultaneously inverts these traditions with a modern spin. I lost count of the classic films honoured in some way or another in the stunning ‘Epilogue’ sequence. The film’s real beauty, however, comes from the incredible performances of its two leads – their performances enough alone, in my opinion, to warrant the hype surrounding the film. 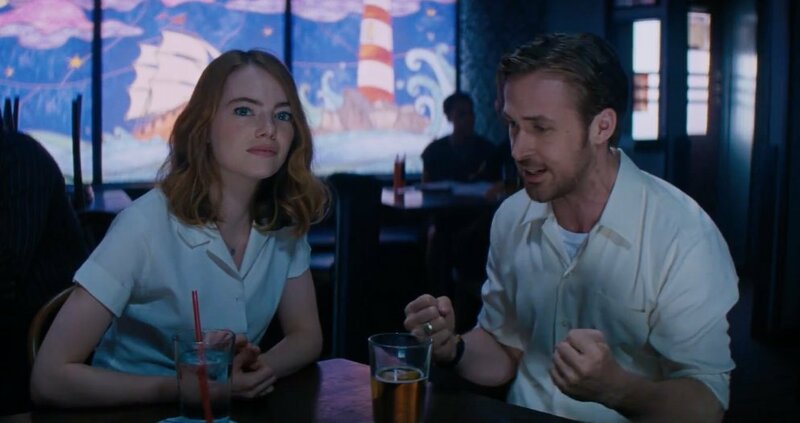 Both Emma Stone and Ryan Gosling so effortlessly capture what it’s like to be so desperate to make it in the creative industry – the first audition scene in which Stone somehow manages to act being an actress is one of the most emotive pieces of acting in years. Gosling on the other hand, delivers the most incredible stare since Humphrey Bogart in Casablanca (if you know, you know) – if a look in one’s eye was enough to win an Oscar, he’d have it, hands down. The chemistry of the lead couple is phenonmenal, infectious at times, and one of the main things I picked up on my third viewing of the film is the way in which they adopt each other’s mannerisms so subtly as the film develops. Towards the end of the film when the pair are discussing where they stand, Gosling makes reference to an earlier comment made by Stone during an argument. He playfully remarks, ‘you love jazz now!’, a subtle instance that filled me with both joy and heartache – this film is not Classical Hollywood in terms of smiles and rainbows, but it is very much Classical Hollywood in terms of the skill and craft of its leading actors. Some people have criticised the musical numbers. They have been critical of the singing ability of Gosling and Stone, and the fact that the opening number, ‘Another Day of Sun’ isn’t belted out in a Broadway-esque style. I’m happy to admit that neither Gosling or Stone deliver pitch perfect vocals, but to say that they cannot sing would be completely false. Their imperfections are part of what makes the film so brilliant, ultimately, it’s about two people out of thousands trying to make it, they’re not perfect but they’re certainly rough diamonds doing everything in their power to use their talents to be successful. The same goes for the opening number, an explosion into song and dance on a jammed Los Angeles flyover. Had these performers belted out the number with note-perfect precision it would be obvious who should be the ones that make it in the free for all that is ‘La La Land’. The fact they are just as imperfect (but still very, very good) again shows that there are so many people trying and desperate to make it, all it will take is a lucky break for one of them. If you have not yet seen La La Land, go right now. There are always going to be people who don’t quite understand the most critically acclaimed films and certainly bound to be people who decide they hate anything that has hype and praise surrounding it. However, the fact here is that La La Land is a very good film – it didn’t ask to be given 14 Oscar nominations and it certainly didn’t have its success handed to it on a plate! I hope you join me in applauding this beautiful piece of work, I know for a fact that I will be utterly delighted when it wins the numerous Academy Awards it deserves! As we approached the New Year I asked a couple of members of my family what the best film they saw in 2016 was. A few answers were given, but the general consensus was the there had been quite a few ‘pretty good’ films this year – Arrival, Eye in the Sky and Spotlight to name a few – but nothing overwhelmingly special. It took a few minutes into this conversation for a film even released in 2016 to even get mentioned – the question, “Was Whiplash released this year?” was asked (no Dad, that was 2014…) – and it really got me wondering where this seeming lack of great films had come from and what that said about the state of the film industry. When it came to it, I struggled to answer my own question. There were plenty of times I saw really enjoyable films this year, but nothing that I would rush to recommend over one of my old favourites. I settled on The Nice Guys as my 2016 pick – funny, original and a film I could watch over again, but it wasn’t a patch on films like Whiplash, Boyhood and Drive that we have been lucky enough to witness in recent years. There’s certainly nothing wrong with a sequel/spin-off/reboot/cinematic universe – I’m not saying I didn’t enjoy a number of these films, but it does seem to be getting a bit ridiculous now. It boils down to an argument at the core of what cinema is, is cinema an art or is it a form of entertainment? I think my point is that it can be both, and the best films are exactly that; take Arrival as the example, Denis Villeneuve created a film that had artistic qualities – stunning to look at, complex but rewarding to understand – yet didn’t do this at the expensive of being entertaining. A wide audience enjoyed Arrival and I doubt they would have done so if it had just been a ‘pretentious piece of art’. In the 21st Century, a great film should be something that audiences rave about long after the credits have rolled on social media, not just something that they see and think, ‘well that was pretty easy to watch and kinda similar to the last one in that series’. Where does this leave us, then? It’s obviously correct to presume that studios prioritise commercial success over technical virtuosity and at the end of the day, they’re probably right to. To the studios, filmmaking is a business. A film could be an artistic masterclass but if it does not make money then the studio will not bother using their money in that way again. There’s no longer anything breathtaking about seeing the same Superheroes fight similar villains over and over again, but pumping money into these superhero universes is a guaranteed way to make a quick buck, taking a risk on an up and coming filmmaker with what seems like a unique script is not. My message therefore, is not that there’s an easy solution to what I see as a lack of originality, a lack of fresh ideas and quite frankly, a lack of real excitement within the film industry, but that there are certainly ways around regurgitating the same, safe stories over and over again. It’s all about ensuring that the films can stand-alone just as well as they can contribute to the ‘universe’ surrounding the film, whether that’s a literal cinematic universe or a vast fandom that demand answers and merchandise and the key to this is most certainly a good script, no complacency and no fear of breaking away from the traditional storylines of a franchise or certain type of story. There are things to be optimistic about – I have never been so excited for a film to be released as I am for La La Land to grace our screens here in the UK yet 2017’s biggest ‘hits’ look to follow this seemingly unoriginal pattern. I’d be lying if I said I wasn’t excited for Blade Runner 2049, Spider-Man: Homecoming and Star Wars Episode 8, but I just wish there were more Se7ens and Whiplashes being made rather than remakes of films that were fine as they were (*cough* The Mummy *cough*) and sequels to obviously tired franchises. I’d be interested to know what other people think about the ideas I’ve raised here, leave a comment or drop me a tweet. Denis Villeneuve (Prisoners, Sicario) builds on his already impressive filmography with Arrival, potentially his best work so far. 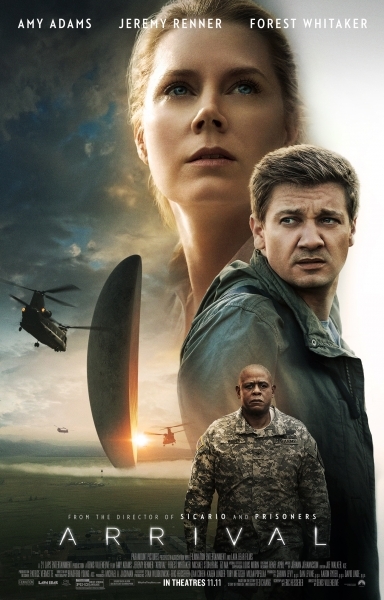 The film follows protagonist Dr. Louise Banks (Amy Adams), a linguist who is chosen by the American military to help investigate the sudden arrival of 12 alien objects on Earth. She is joined by scientist Ian Donnelley (Jeremy Renner) and the pair attempt to translate the mysterious images used by these alien creatures in order to try and work out why these aliens have come to Earth and help prevent international military forces from taking action. Although Arrival would (rightly) be classed as a Sci-Fi film, its just as much about language and time as it is about science and it is the fusion of these themes that make it arguably the most intriguing film of the past year. It’s hard to know how to describe the large ‘pods’ that arrive on earth, yet Villeneuve utilises the visual power of cinema to create such immense and overwhelming objects that fascinate the viewer from the first moment they are shown. The alien presence is the subject of much talk before we actually see it, creating suspense but also highlighting one of the film’s main themes – what they look like doesn’t really matter – it’s what they mean, the message they are trying to create, that is key. As the film develops it is clear that this is more than a ‘find out what the aliens are doing and then destroy them’ plot; the aliens have arrived for a reason and it is paramount that somebody understands the message they are trying to get across in order to prevent their presence escalating into nuclear war. The central character played by Amy Adams may initially be seen as a relatively one-dimensional woman, carrying a fair few emotional issues and unable to truly assert her dominance amongst these military men. Yet as the film develops it is clear there is a lot more to her than that and as her relationship translating the alien language becomes more complex it is clear that her ‘backstory’ is a lot more than baggage, it is key to our entire understanding of the message the aliens are trying to get across and therefore essential to our understanding of the entire film. Adams plays the role of Dr Banks perfectly and manages to do what has been nearly impossible in recent years – become a genuinely credible Oscar candidate despite being a female in a Sci-Fi role. What is so astounding about Arrival is its lingering message. The fusion of time and language in an ‘alien’ context addresses modern day worries about communication, divisiveness and survival. Overcoming divisions are essential to our cooperation in today’s society and the film addresses this in a complex, yet not at all ridiculous way. Sci-Fi has become a somewhat saturated genre in recent years, but Villeneuve’s take on it is one of the best, gripping the viewer from the get-go and then plunging us into emotional depths that the genre often fails to achieve. It’s surprising how little time I’ve had to watch films for enjoyment since beginning my degree in Film Studies! 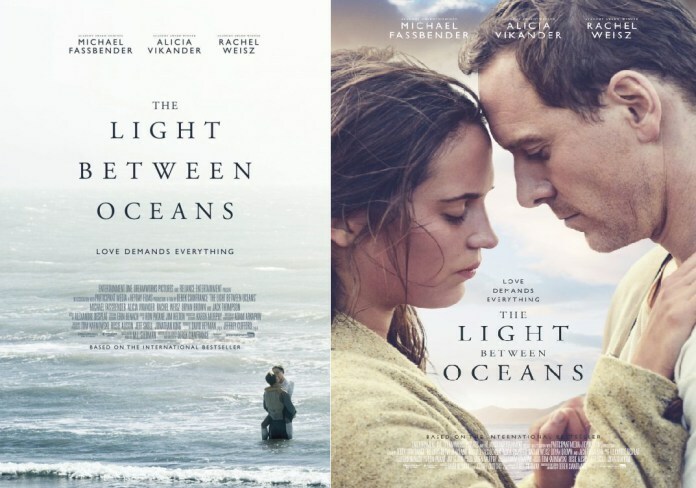 Using the first day of ‘reading week’ as the perfect excuse to explore my new local cinema for the first time I decided to go and see Derek Cianfrance’s latest romantic drama, The Light Between Oceans. Being a big fan of Cianfrance’s previous work, I was well aware that my choice of film would lead to me starting the week in a rather depressing manner; I was not wrong. The film presents us with a number of wonderful acting performances; most notable (not surprisingly) are the performances of Fassbender and Vikander, their real-life chemistry translating beautifully on screen. Both manage to portray characters we feel we should dislike somewhat, yet the prominence of both their innocence and naivety makes us sympathise greatly with their situation despite their mishandling of it. Fassbender in particular always maintains a mysteriousness about his character – our knowledge of his war days remains very minimal, but his performance ensures that his past is always in the back of our minds. Whether or not these two names will even be mentioned during awards season is a question for a later date, although The Light Between Oceans allows them both to be worthy contenders. Cianfrance’s use of cinematography combined with a stunning soundtrack creates what can only be described as a sensory experience. The gorgeous visuals create a real sense of this gorgeous setting – we are always aware of how distant the lighthouse is from the rest of the community, isolating Tom and Isabel and thus intensifying their relationship. The dramatic score complements the cinematography, always heightening the feeling in the film’s most emotional moments. However, The Light Between the Oceans is not without its flaws; Cianfrance’s unrelenting desire to force tears out of the eyes of his viewers make the film a somewhat tiresome watch. At times, the plot feels contrived, driven purely by the desire to be as dramatic as possible, rather than to tell what is mostly a very emotional story. The extensive use of voiceover as the pair of lovers communicate by the means of letters is initially heartwarming, but as letter after letter is read out to us, it becomes rather cliched. Derek Cianfrance certainly lives up to his reputation as a director that can pull on our heartstrings with his newest film. Although at times the desperation to force emotion hinders the film, its visual prowess and fantastic lead performances make this one of the most enjoyable and heart-wrenching (yes, the film somehow manages to do both of these things at the same time) watches of the past year or so. The Light Between Oceans is out now. After another mistake that leads to the Avengers causing as much destruction as they do joy, the general public have had enough. Presented with the ‘Sokovia Accords’, a UN agreement that decides that the Avengers must be regulated in order to prevent further damage. Supported by ‘Team’ Iron Man and condemned by ‘Team’ Captain America, the Avengers are on the brink of havoc and of course it wouldn’t be a Captain America film without our good old friend, Bucky Barnes, diving opinion once again! ‘Civil War’ includes an almost excessive number of superheroes but with such cohesion – everyone adds something to the story and quite frankly, it’s a joy to watch. At the very heart of the film is the long-standing friendship between Steve Rogers/Captain America and Bucky Barnes/Winter Soldier and the struggle Cap faces in trying to convince his superhero buddies that Bucky is an honest and good person – the friendship further drives Captain America and Iron Man apart and proves that this ‘civil war’ is not going to be that is easily solved. As usual, the film provides us with the things that make Marvel, well… Marvel – intelligence is at the core of Captain America: Civil War. This film is more than just a superhero ‘smash up’, there’s not even a proper villain as such but the film really doesn’t need one – Captain America and Iron Man are just as much villains to each other as they are heroes to the world, creating an entirely thought provoking and enthralling battle. It just so happens that this isn’t the first ‘superhero vs. superhero’ film released this year, but it’s certainly the best! The inclusion of more than just the title characters seems necessary here (unlike Batman v Superman – Wonder Woman’s inclusion was totally pointless and still makes me angry thinking about it!) A special mention must go to the introduction of Spider-Man, finally able to be in the Marvel Cinematic Universe after a battle of rights between Marvel Studios and Sony. Tom Holland gives Spider-Man the showing he’s deserved for so long, providing a youthful, comical and comic book-esque take on the well-loved character. He’s exactly the kind of character the MCU needs to continue developing and yet the inclusion and development of Spider-Man doesn’t detract or interfere with the plot of this film, it is a Captain America movie after all, but the presence of Spider-Man alongside fellow newbie Black Panther only add to the story. Captain America: Civil War is an example of Marvel Studios once again proving that they should be the ‘go to’ for an intricate yet entertaining Hollywood blockbuster. I suppose you could call it ‘Avengers 2.5′, but to do so would detract from the individual merits of each character; what makes Civil War so impressive is that it delves into the stories of many, yet always ensuring that the main themes of a Captain America story are at its core. Providing all the punches and explosions we simply expect from a Marvel film, Captain America: Civil War is one of their best, mixing traditional action with emotional tension – I for one cannot wait to see the Russo brothers’ take on Avengers: Infinity War. 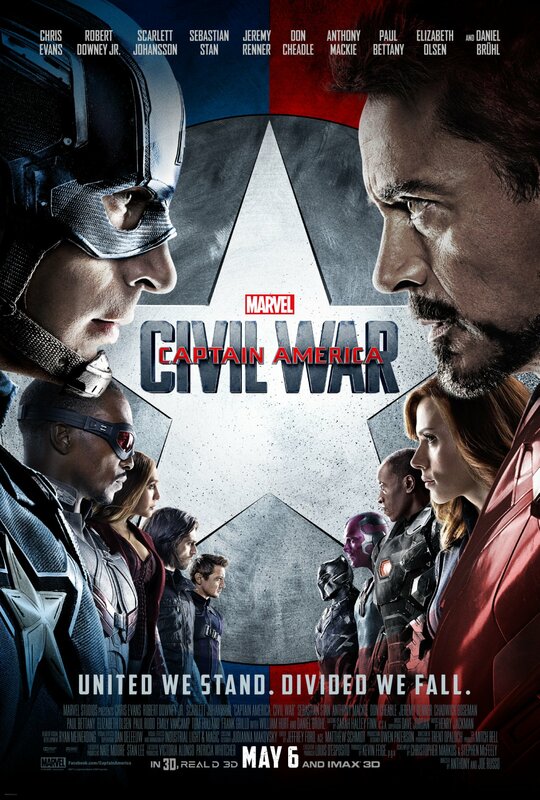 Captain America: Civil War is out now in the UK and on May 6th in the USA.